A beautiful one bedroom apartment - right on the waterfront in the Ria Formosa. Beautiful one bedroom apartment sleeps 2. For couples and golfers. Fully tiled bathroom, adjacent to bedroom, with full suite. WC, bath with shower over, bidet, wash basin with light over mirror. Towels will be provided. Hairdryer provided. Fully equipped kitchen. Combined 4 burner electric hob & extract hood, electric oven, washing machine, dishwasher, fridge/freezer, microwave, electric kettle, toaster and coffee machine. 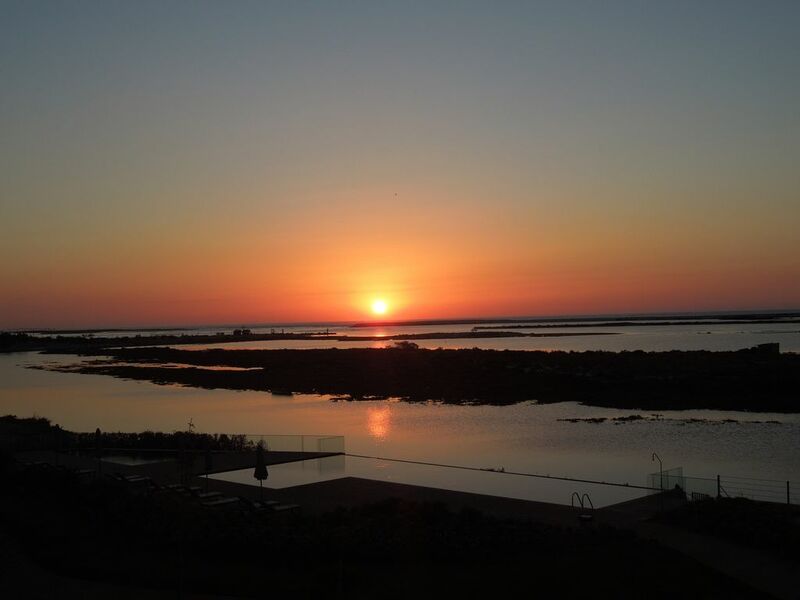 A perfect holiday destination for people of all ages, whether it's relaxation or plenty of activities you are looking for - you can find it all here in this beautiful, friendly part of the East Algarve. Situated on the edge of the fishing village of Fuzeta, Del Mar is a closed condominium of luxury, contemporary apartments, with large private gardens and superb infinity pool. The location is absolutely unique; On the edge of the Ria Formosa Natural Park, it is a sea lover and bird watchers paradise. Every apartment is built facing the ocean, with huge windows and private terraces to take in the ever changing view of the tidal lagoons and sandy beaches. Here you will go to sleep to the sound of the waves and wake up to the view of the sea, ready for breakfast on your idyllic terrace. Just a few minutes walk from the centre of this friendly, traditional village, with plenty of shops selling fresh produce, a great choice of restaurants, small coffee shops and bars..
Kortom,geweldig verblijf en van ons krijgen zij een dikke 10 !!!!! It´s very important for us, that you´ve enjoyed your holydays, in our apartment, at the Del Mar Village-Fuseta. We decided at very short notice to visit this lovely part of Portugal and Pedro could not have been more helpful in making his beautiful aparment available for us. We found it incredibly clean and immaculately presented with stunning uninterupted views across the Ria Formosa less than 50metres away. We certainly intend to return in the future. Thank you. It was very kind of you. These words give us motivation to do our work better, month by month, in order to give a better service for the new customers. We stayed one week in this beautiful apartment in Fuseta. The apartment was very clean and nicely furnished, it has very comfortable beds and a fully equiped kitchen. The complex has a beautiful garden and nice pool, but the best feature of this accommodation is the splendid view. With the always changing water, light and skies, you almost don't want to leave your balcony! We are nature- and birdlovers and have traveled a lot, but this is one of the most special locations we have ever stayed in. The booking via the owner Pedro went smoothly and he always responded quickly to our e-mails. The ladies in the rental office are also very helpful. Fuseta is a very nice, quiet fishing village with lots of good restaurants and beautiful beaches. The bigger towns of the Algarve, like Tavira, Silves and Lagos are in easy driving distance. We like to be active during our holidays and found this the perfect location for Stand-up-Peddling, swimming and riding the mountainbikes. A week was definitely too short for us and we hope to come back very soon! Thank you for your coments. Day-by-day, we try to do our best in order to give a nice rest and a good holydays to our guests. From our first enquiry through to our departure, we have been extremely pleased with this booking. Pedro responded quickly to numerous emails and initial phone call, answering all our questions about the apartment and surroundings, and arranging a very good transfer for us. On arrival we were greeted by Sonia and Shirley, who showed us everything we needed to see, and were available throughout our stay. This was in addition to a comprehensive file of information kept in the apartment. The Del Mar complex has a lovely pool and very well-tended, peaceful and secure gardens. The apartment itself was fabulous - well equipped, clean, and very comfortable. We made full use of the kitchen facilities, and both bathrooms. The relaxing lounge and bedroom opened onto a decent sized balcony with views to die for. Fuzeta itself is unspoilt by tourism, but has everything you need in walking (or boat) distance, with a good choice of shops and places to eat and drink. The beaches and surrounding countryside make this a very pleasant place to stay, and no car is required. If you want to venture further afield, there is a train station less than five minutes walk away with a very good service to other towns, and it’s possible to do a day trip to Spain via train and ferry. We found no faults at all. The apartment was superb, the location is lovely and we are hoping to return in the spring. It´s very kind of you. Day by day, we try to do our best in order to give to the customers a good pleasure durind their holidays. Die Übergabe der Ferienwohnung bei der An- und Abreise verlief sehr unproblematisch und professionell. Die Ausstattung entsprach unseren Vorstellungen und das moderne Ambiente hat uns gut gefallen. Kleines Manko- die Filzstopper an den Stuhlbeinen hielten der Belastung nicht Stand. Gern buchen wir auch im nächsten Jahr hier wieder.